We played some 6mm Napoleonics last night, using the Polemos ruleset from Baccus. Only a small game of General de Division, 15 base minimum. Army composition is semi-random. You agree a minimum number of bases and roll on the charts (unique for each army and period) until you have reached the minimum number, then you keep rolling to finish the division/brigade. Which means that armies are almost never exactly balanced and are instead...mostly balanced. The game itself really comes alive in command, control and maneuver rather than in the specifics of combat resolution which is basically d6+modifiers for things like being veterans, first time you fire, high ground, etc. most of the time forcing one side to fall back 'shaken', accumulating enough 'shaken' levels causes you to flee. Eventually brigades take enough damage or 'shaken' levels that they fail a test and become 'spent' and retreat to the rear. Red arrows and text is for the 'tempo' player and green is for the 'non-tempo' player. There's a bidding phase each turn to determine who has tempo, usually meaning the player with tempo gets to give fewer order (as they act fast they can't send as many messengers!). Tempo player completes all of their moves attacks and artillery bombardments first, then the non-tempo player does theirs. White is for people running away. The French side (1815 waterloo list) brought 7 stands of veteran infantry plus one 6pdr cannon battery (at the top of the pictures, forms column turn 1), 6 stands of the old guard veterans in the center and 7 stands of raw recruits at the bottom of the pictures. The British (1812 Penninsular war list) brought an ifnantry division with 4 brigades - 2 of 3 regular british line (deployed on the road), 1 of 2 veteran light infatry/skirmishers (at the top right of the pictures) and one portuguese brigade of 4 regular line and 1 cacadores as well a 1 6pdr cannon battery. 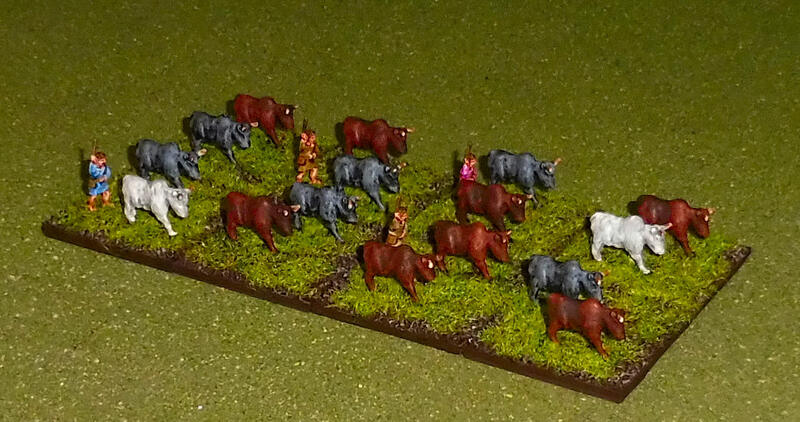 They also brought a veteran light cavalry brigade with 2 stands of elite hussars the only cavalry on the field. Each infantry base represents one battalion ~800-1000 men, cannon bases represent 4-8 cannon depending on time period and army and cavalry bases represent a squadron of ~200. On turn 1 everyone just kind of get moving toward one another. The French veterans at the top deployed in line...facing a hill...they quickly reformed a column and will begin moving next turn. The French recruits at the bottom were busy pulling on trousers and hats and missed the 9am start. The French center siezes the farmlands, hoping to claim cover at the walls and preventing cavalry charging them. British just march forward, no issues with command. Everyone continues moving forward, into cannon range but still just outside of firing or attack range on infantry. The British veterans at the top begin their flanking maneuver. The British cannon swings out of the way off the road to set up for next turn while the French cannon is with the top column and a long way out of use. The French top column realises its mistake as the Britsh cavalry bcome visible from behind the hill, just at extreme range to charge (24cm) their strung out column while the British skirmishers continue forward to add pressure to that side. The Portuguese swing out wide and a British Brigade gets confused about how to walk along a road. The French reform to control the farm and the French recruits continue forward, catching up after their late start. The British cavalry charge goes splendidly, breaking, chasing and wiping out two French battalion in pursuit and running completely clear of the rest of the column. The Skirmishers at the top size the hill and force the French to split attention between the cavalry and the infantry attack. In the center the British cannon fails spectacularly and cannot fire this turn nor next. The French come forward while the Portuguese cacadores detach to form a screen and the main column swings wide to sieze the hill at the bottom of the pictures. The decisive turn! The British cavalry swing round and hit the French infantry and cannon in the rear as they face the skirmishers on the hill, breaking a battalion, the cannon and importantly, the commander of the division/brigade (the French need to roll a 3+ to appoint a new one each turn...they never manage it). In the center the French, feeling the pressure launch an attack on the British on the road, abandoning their defensive position and rolling 3 1s for the attack and being driven back. At the bottom the French advance to drive the Skirmishers off and expose the Portuguese flank while the remainign French advance to contest the hill. Actions swings to the bottom with the Portuguese seizing the hill and having the French form a line to resist them. The French recruits learn a harsh lesson about attacking Portuguese elites cacadores in column and are driven back badly. The French and British in the center reform, rally and recover but are otherwise silent. While the French form squares at the top and repulse the cavalry but are essentially stuck defending for the rest of the game. The Portuguese attack downhill while the cacadores follow up again, breaking the recruits morale whose whole formations runs. The cavalry up top remain unable to find a way into the squares and a British attack in the center drives the French from the barricades but is unable to break the will of the Old Guard. The game ends due to time but with the French in shambles it's a matter of time until they gets surrounded and captured. I like the idea of force variability. As has been said, you fight with the army you got not the one you wish you had. Does that approach require having lots of extra minis on hand, or does the 6mm scale mean mitigate that? That looks cool Scutarii. The random generation for units seems interesting, as long as everyone is on board for potential wide swings in unit quality. Stargrunt II had a rule that let you represent combat losses and troop rotation if you wanted. You'd roll a die (of the unit's quality, D4 for non-coms, D12 for elites) for each model and on a 1 they were absent for the battle for whatever reason. It gave a nice ad-hoc feeling for armies. Generic enough to go with a lot of thing, though the skin and hair colours of the cowherds would suggest a northern European origin. Nice cattle! I like to have livestock, transport, and civilians for my games when at all possible. What scale are they? Looks small--10 or 15mm? 15mm figures from Magister Militum. 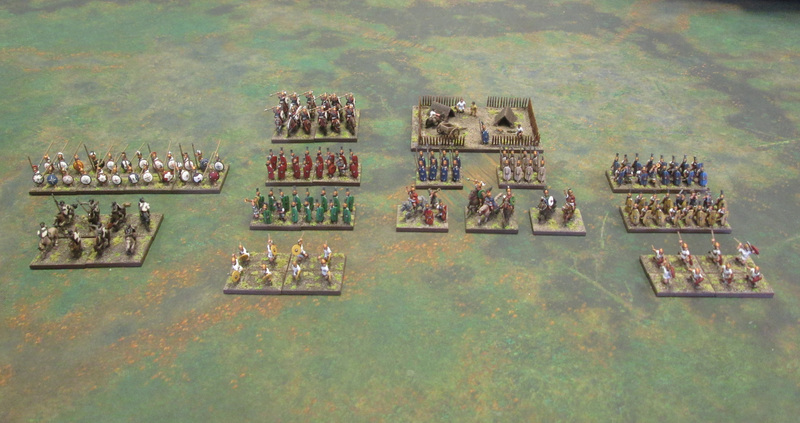 I played with my Classical Greeks, as close to his army's time period as I could do it. Like previous demos, I kept it simple, with a quick random terrain set-up and using starter armies from the Army books (~600 points). The game went slow, since I was running him through every step, giving him help and tactical advice, etc. The center of the table was open, with some rough and difficult terrain in the flanks and backfields on either side. Basically, the Romans advanced dead center in echelon (Hastati & Principes in front, Triarii in the rear) with Italians on one flank and the Roman Cav on the other. The Greeks strung out in a long line, with the Spartans in the center (facing the Legions) and on the left flank, and the Athenians and Corinthians on the right. I had the advantage of numbers, so I was able to start turning both his flanks. While his Cavalry foolishly got into range of Perioikoi and chased off and the Italians died fighting the Corinthians, the center Legions punched through other Corinthians, breaking their battlegroup. I wasn't trying anything too mean or sneaky, since this was his first game, but he did fine despite losing. He did get to see how powerful the Legions really are, with advantages in nearly every aspect of the game. They even were able to peel off a Legion and both Triarii groups to protect his right flank, something few armies would have the ability to do. We'll get another demo down soon. I also got in a game of Saga: Age of Crusades. I was trying out the Crusaders, while my regular opponent fielded Moors. I've been working on some Crusade-era mounted troops, but I had to sub in some of my Roman cav to bulk out the unit of Hearthguard. The knights and men-at-arms are based of Polish heraldry. I want to be able to use the models as Poles, Crusaders, or Milites Christi. In this game we played the Battle Twilight scenario from the old Crescent & Cross book. In this scenario, the armies are placed mixed over the whole table, with control over the table quarters the key to victory. In addition, all units except Warlords and mercs get to come back when they're killed, coming back on any table edge. It's a pretty fun scenario, since you have to fight off enemies while keeping your own units alive enough to count for control of the quarters. In the end, my Crusaders accumulated the most points and won. My Knights did real work, wiping out 5 units (including the Moorish Warlord), coming back 3 times. We are really hoping to see the new scenario book soon. Sounds like a few wargamers I know. I'm thinking particularly of Carl, who hasn't found a minis game he didn't need to get into yet. No need to shame me, man.